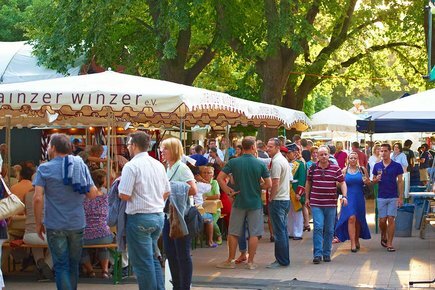 On the last weekend in August and the first weekend in September, the city park of Mainz turns into one of the largest wine markets in Germany. Its wine stalls and the funfair attract visitors from near and far to soak in the atmosphere, sample some wine, enjoy great company or buy some of the local produce. At around 50 stalls, local producers from Rheinhessen present their wines. Also represented is one of the other Great Wine Capitals of the network to which Mainz belongs. The market offers fun for young and old with special events for children. The annual Sparkling Wine Festival and the Artist's Market take place in the romantic rose garden.